This week we have been looking the different patterns that can be made by different quantities. 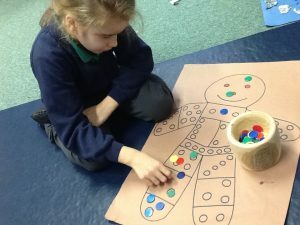 The children noticed that the gingerbread man had different patterns in each part of his body. They were able to name the amount of buttons just by looking at the pattern in some sections and for others they had to count carefully. We then used counters to fill his buttons to practise counting different amounts. 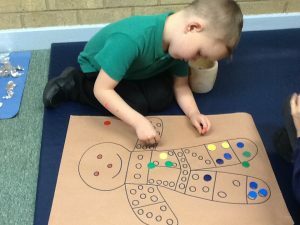 We also looked at the numicom shapes that match each amount and even worked out how many buttons there were altogether on both feet. Great work Robinson Class!